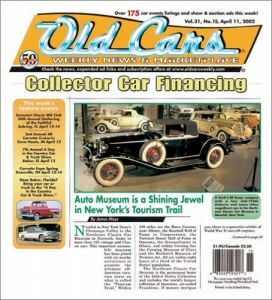 Old Cars Weekly News and Marketplace Magazine serves 70,000 collectors of classic cars , trucks , motorcycles and military vehicles with features on restoration tips , auction results , car show information, how-to articles and essential information about hobby events and marketplace activity. Old Cars Weekly Magazine helps you find or sell, fix and have fun with specialty vehicles and hard-to-find parts from 1900 to 1999. Regular features include Weekly classic-car auction results, Car-club information, extensive display and classified ads as well as expert stories and columns!